Analysis of Causes Influencing Downstream Stage-discharge Relation of Changzhou Hydro-complex ZOU Xiaohong;Guangxi Changzhou Hydropower Development Co.
Study of Stability of Hydraulic Concrete Structures of USACE LI Xuefeng;China Energy Engineering Group Guangxi Electric Power Design Institute Co.
General Layout Design of Nam Chiane Hydropower Station in Laos ZHANG Jinqiang;China Energy Engineering Group Guangxi Electric Power Design Institute Co.
Design of Diversion Tunnel of Nam Tha-I Hydropower Project in Laos MA Gao;TAO Lin;China Energy Engineering Group Guangxi Electric Power Design Institute Co. 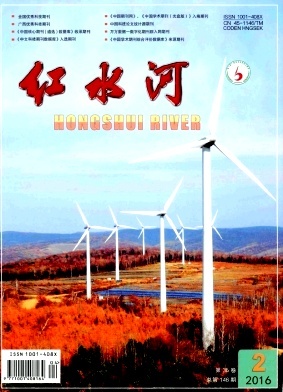 Discussion on Water Balance of Cascade Hydropower Stations on Hongshuihe River HUANG Cunyu;Dahua General Hydropower Plant of Guangxi Guiguan Electric Power Co. Discussion on Localization of Composite Material Sliding Bearing in Hydropower Projects LI Yunlong;Dalian Sanhuan Composite Material Technology Development Co.
Construction Technology of Cut-off Wall for Measuring Weir of Houziyan Hydropower Station in Sichuan XIANG Jianqiong;HU Zongbao;China Gezhouba Group Foundation Engineering Co.
Hydrological Design for Transmission Line Crossing Navigable River WANG Le;China Energy Engineering Group Guangxi Electric Power Design Institute Co.
New Method for Drying Generator Stator in Erection Bay TAN Xuewen;HUANG Weiping;HU Zhenzhang;Dahua General Hydropower Plant of Guangxi Guiguan Electric Power Co. Discussion of Water Leakage of Unit Distributor Bushing of Qiaogong Hydropower Station HUANG Fu;Qiaogong Hydropower Station of Guangxi Fangyuan Electric Power Co. Method for Improving the Reliability of Five Prevention Locking System of Changzhou Hydropower Station FU Xuehui;Guangxi Changzhou Hydropower Development Co.
Technical Innovation of Measuring Weir Method in Observing Dam Seepage of Yantan Hydropower Station YAN Wenjian;Datang Yantan Hydropower Co. Analysis of Short-term Loop Parallel Operation of High-voltage Auxiliary Transformer in Hydropower Station ZHANG Jicheng;Longtan Hydropower Development Co. Analysis of Unit Information Collection Before Maintenance of Bulb Hydro-generator YANG Zhanao;Guangxi Changzhou Hydropower Development Co. Selection of Construction Equipments for Cast-in-place Pile in Deep Ballast Backfilling Layer WEN Li;China Gezhouba Group Foundation Engineering Co. Discussion of Online Security and Defense System of Guangxi Power Grid in the Thirteenth Five-year Plan Period NIE Yu;KONG Lingjian;Guangxi Power Grid Co.